Especially during Thanksgiving, things can get hectic both in and out of the kitchen! From trying out new family recipes to lounging around the fireplace, nothing can beat being surrounded by family. But throughout this excitement, it can be easy to get distracted from the roasting turkey. Sadly, this is why many families suffer through disastrous fires, engulfing their turkey, oven, building materials, furnishings, and personal items. On the other hand, you can significantly reduce the chances of this catastrophic event from happening to you and your loved ones. Check out these Thanksgiving fire safety tips. While these tips will significantly reduce the chances of a fire from occurring, it is almost impossible to prevent them from happening altogether. 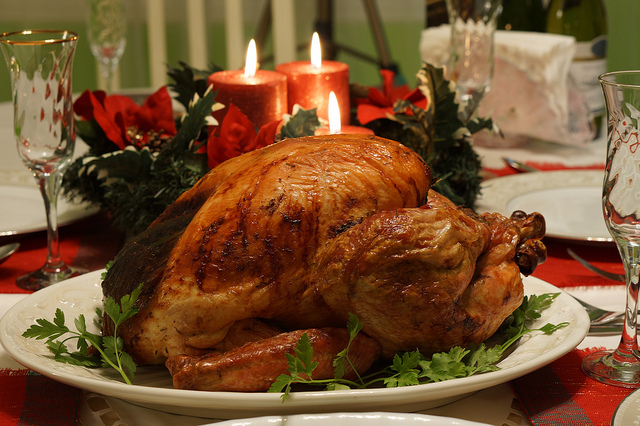 The U.S. Fire Administration reports over 4,000 Thanksgiving fires each year, and most of them start in the kitchen! If you have already experienced a fire, don’t panic. ServiceMaster by Restoration Contractors is available in the Fort Wayne, IN area to provide emergency fire damage restoration services. We understand how devastating it can be to have a Thanksgiving fire, which is why we are available 24/7, even on Thanksgiving Day, to put you and your home back on track. With professional cleaning products and equipment to perform the necessary repairs, we can have your home fully returned to its original condition in a timely manner. Give us a call at (260)420-1502 in the event of a Thanksgiving fire disaster. Keep all children and pets away from the kitchen. They will be naturally curious about that amazing smell wafting from the stove, but it is crucial that they are kept at a safe distance until you are done cooking. 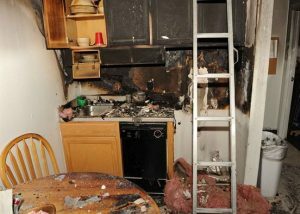 If you choose to fry the turkey, do so away from the house, exercise extreme caution, and review general safety tips to prevent a turkey fryer fire disaster. Do not overload any circuits. Unplug small appliances that are not needed for cooking. Clear the floor of all obstacles, including papers, toys, bags, etc. Hang up electrical cords of appliances, including the coffee maker, electric knife, plate warmer, mixer, etc. Keep a small fire extinguisher handy and ensure that it is in proper working condition. Ensure that all smoke alarms are in proper working condition. Keep matches away from children, preferably in a high cabinet in the kitchen. Take down dangling accessories, such as pots and pans, to prevent them from being knocked down while cooking. Roll up your sleeves or wear tight fitting clothing to prevent them from catching on fire while cooking. Set timers. In addition to prevent the food from burning, you can prevent it from catching on fire on the stove or in the oven. Never leave the home while the turkey is cooking. Keep all combustible items, such as towels, oven mitts, pot holders, paper towels, paper plates, etc. away from the stovetop burners. Keep the number of emergency contact numbers on the refrigerator and/or on your phone. This includes the hospital, fire department, insurance company, and emergency disaster restoration company. Even after putting hot food on the table, keep children away until it cools down. Supervise young children and pets around candles. Try to keep them out of their reach. Walk around the home after guests have left. Make sure that all candles are blown out, the fire place is extinguished, appliances are turned off, and all sharp objects are put away. Remember that fires can still occur due to the heightened number of possible causes during Thanksgiving. These include lights, candles, fireplaces, stoves, ovens, and overloaded circuits. But ServiceMaster by Restoration Contractors continues to stay open during the holidays, arriving just in time when a disaster occurs at the worst time. We hope that you don’t see us on Thanksgiving, and that you can enjoy this holiday celebration with your family. But you can always count on us when the unexpected occurs, returning your home to its original condition. Finally, it is our goal not only to restore property structures, but peace of mind after Thanksgiving fire disaster.